This news is for paper and ink lovers! We’ll talk about the book printing process! But when you spent more than a year on a project, you don’t want to have the book ruined with random colors, so the process I’ve been through was a bit more complex (but much more reliable!). Well, if you follow these news and/or the facebook page, you already know I already completed 6 of these steps! For the final one, I went to Lesaffre printer, in Belgium, to check directly the result. They are specialized in French and Belgium comics. In this big (and clean!) warehouse, there are huge paper rolls… That’s something like 15 kilometres (9 miles) of paper! Machines are the size of a bus. And very noisy. When I arrived, the printer employees were analysing my pages on their work table. Several pages are put together on a big sheet of paper. If you change colors on one of these big sheets, you change the colors on all pages contained on the sheet, so the printer often put the pages of the same hue together. All these beautiful pages were just tests and are going to be recycled (but I kept some as a souvenir). When you agree with the result, you sign (again) the printed pages. The printer is so fast, it can print thousands of pages in one hour. That’s the book! Yes, your book is for now a giant stack of sheets. I can honestly say the colors are just perfect for me, I didn’t expect such a good result. 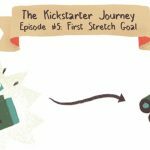 Every friend who has already printed a book told me you have a big loss when your illustrations go from digital to print, but I didn’t see anything like that. The printers knew very well their job! Thanks for reading! I can’t wait to see the final books with hardcover. See you soon! 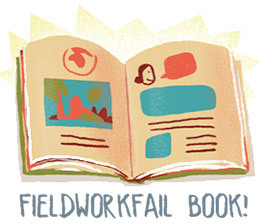 Fieldwork Fail Book : Monthly news!